Disclaimer: I am a big Jeep fan and have been driving them for 30+ years. That doesn’t mean I love everything they come out with though, like the Renegade. It looks kind of cool but its drivetrain is based on the Fiat 500L. We get why it’s coming out to fit in the growing small SUV segment that is rapidly becoming blurred with CUVs. At the show we got a chance to get in the Renegade at Camp Jeep. This is a must see, even if you are not a Jeep guy like me. Listen at the end of the video as I comment that it’s a nice little “car.” Click on the image and let’s roll. Besides the Renegade, there were a bunch of others targeted for this growing segment. 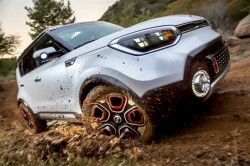 I think the coolest concept came from Kia. Check out what we learned at that reveal. 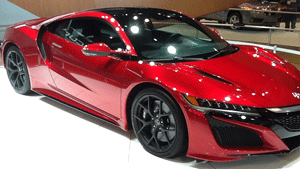 Two cars stole the show in our view, the new Ford GT and the new Acura NSX. The NSX arrived in Chicago a day late and I heard one factory rep tell another that it picked up a nick in the paint job leaving the Detroit show and needed a touch-up. Here’s our shot of the gorgeous red NSX. 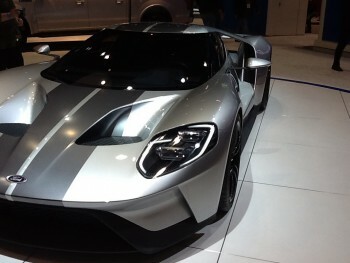 But take our tour of the Ford GT and other high-perf cars at the show. Chicago is always a fun show with a lot of hot cars. 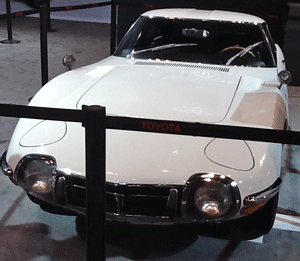 One vintage one we’d like to share is this white 1967 Toyota 2000 GT, which was the most expensive production car at the show, with a value of just over $1 million! Oh, and we rode to the show and back in an equally cool white Jaguar XJL. While Mark and I never agree on politics, we almost always agree on cars, like what our “one car” would be, a ’63 split-window Vette. We also liked this hot model pictured below. We’ll leave it up to you to decide which one we’re talking about. Hey, it’s a car show!